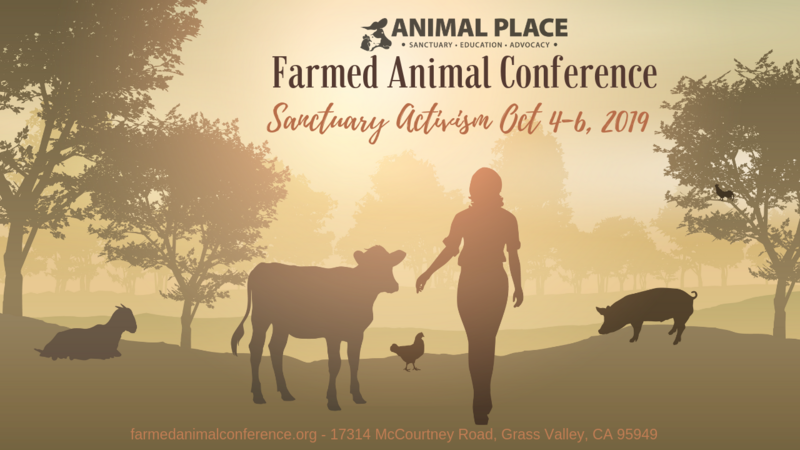 Animal Place's Farmed Animal Conference is a one-of-a-kind experience! Workshops are hosted inside pastures, in barns, or at our education pavilion. Our goal is to inspire you to put your compassion into action for both nonhumans and humans! This year's theme is Sanctuary Activism. Topics covered will include starting and running a sanctuary for farmed animals, animal care protocols, sanctuary campaigns, and more! When is check-in? For non-campers, check-in is Saturday or Sunday from 7-10 am. If you arrive late, that's okay, there will be someone near the front entrance who can help you. Do I need to pre-register? It is strongly encouraged. Register online. Tickets will be available at the door - $75 for Saturday, $75 for Sunday or $135 both days. The sooner you register, the more likely it is you'll be able to sign up for one of our limited-capacity workshops. Is there lodging within walking distance? Campsites are available within walking distance of the sanctuary. No showering facilities. Bathrooms and water available. Camp stoves permitted. No fires allowed. Campsites are $30/night. Reserve yours during registration. Camping guidelines. Rooms are also available at our Guest House, reserve your room or bed separately! Is your sanctuary wheelchair accessible? The event is spread out across our sanctuary, including some areas into pastures that are not accessible to wheelchairs. Workshops located at the education pavilion or outside of pastures are generally accessible. The main road down into the sanctuary is paved and we can make accommodations for those with mobility issues. What should I wear? Since many of the workshops take place inside barns and pastures, for your safety you will need to wear closed-toed shoes. As we are at the height of the rattlesnake season, long pants are strongly recommended and are required if you want to go in with the cows, pigs, or goats. Does my ticket include food? Your ticket includes complimentary continental breakfast for Saturday and Sunday. It does not include lunch or dinner Friday, Saturday or Sunday. Food vendors will be available for lunch Saturday & Sunday. Are companion animals allowed? No. Please find appropriate care for your companion animals. Some of our farmed animals are afraid of or aggressive to dogs. And you can never guarantee how your dog will react around farmed animals. What should I bring? We strongly encourage you to bring your own chair or blanket to sit on during workshops. Sunblock, hats, sunglasses, and ample water is encouraged (water available onsite). If I don't want to camp, where can I stay? We have put together a list of hotels and B&Bs that you can consider. This list also includes area restaurants with vegan options. Rooms are also available at our Guest House next door, reserve your room or bed separately! Is carpooling available? Yes, coming soon. What if I have to cancel, is there a refund policy? Full refunds are available if you cancel prior to October 1, 2019. No refunds are offered beyond October 1, 2019.